Congratulations to Chen Chen for passing his defense on November 30, 2016. His Ph.D. thesis is entitled “Large-Scale Scene Classification Using Machine Learning Techniques”. This thesis focuses on solving a general “scene image classification” problem using advanced machine learning techniques. Indoor/outdoor classification, outdoor background semantic segmentation for image classification, and exploration of scene class/image confusion are studied in the thesis. Unlike traditional solutions to the long-standing problems, the research works proposed several innovative machine learning-based approach to resolve the challenges from different angles. Most of the proposed approaches provide the state-of-the-art performance which are highly appreciated in corresponding field of research. We are so glad to have him share his Ph.D. experience with us. Here is his sharing. Having a Ph.D. is definitely not an easy process. 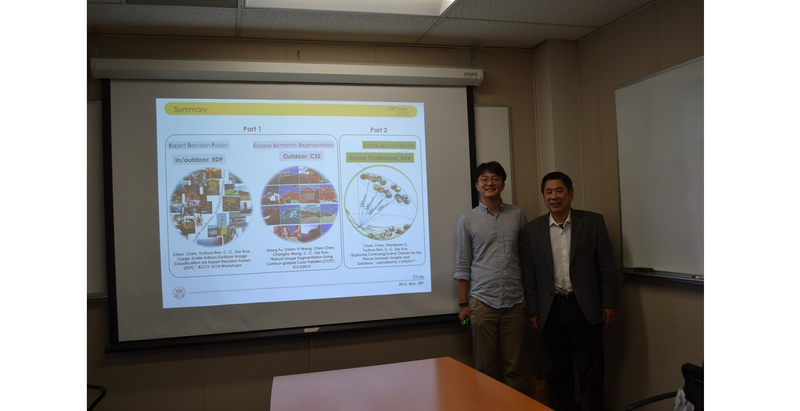 I was lucky to have Prof. Kuo as my advisor/leader/team member in this process. He cared me as child of his own and provided huge amount patience and love in this process. So the PhD study was not as hard as I had heard from other friends of mine. Besides, I learned to be humble, diligent, caring and taking responsibility in this process. I acknowledge my lab mates, my wife and my cats for the lasting support in my life to gain such a huge transformation in my life. Congratulations again to Chen and we wish him all the best in his career in Facebook.